How to Run a Dog Business: Putting Your Career Where Your Heart Is, by Veronica Boutelle. 2nd edition, 2014. Book Review. This is a book for anyone contemplating running a business as a dog trainer, walker or sitter, or operating a dog daycare and boarding operation, or any other canine business adventure. It is filled with excellent advice on running a business in general and a dog-centered business in particular. Besides the author’s sound, sensible and easy to follow advice, she provides mini-case studies so that the reader can glimpse real-life, real-business situations. She advises us on how to analyze, price and market services; determine what licenses, insurance and professional affiliations are needed; create systems to streamline the business venture and avoid pitfalls and burnout; and how to establish sound business practices, maintain profitability and balance personal and professional life. This book is the second edition (2014), revised and augmented, of her original 2008 book. In this edition, Boutelle incorporates recent new knowledge and experience in business marketing, staffing, and packaging a business, including newly available resources. In short, this 2nd edition of How to Run a Dog Business, fills in some gaps that time and changes in the business of running a business necessitate. Veronica Boutelle, is President of dog*tec™, a business consultancy established to help dog professionals with their entrepreneurial enterprises. She has also authored two previous books – The Business of Dog Walking, and (as co-author) Minding Your Dog Business. If you are contemplating starting a new dog-centered business, or expanding or enhancing an existing one, this is an important resource and guide. 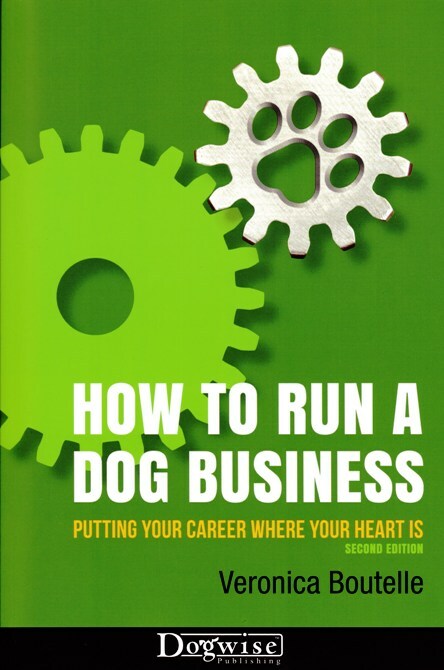 How to Run a Dog Business: Putting Your Career Where Your Heart Is, by Veronica Boutelle. 2014, 2nd ed. . Wenatchee, Washington: Dogwise Publishing. 173pp., Foreword, Introduction, 11 Chapters, Resources, Author Biography, Index. ISBN: 978.1.61781.136.4. “Don’t hesitate to get in touch,” Veronica says. “We love to talk!” — Online at http://dogtec.org. On the phone at (1) 510.525.2547. By mail at P.O. Box 110, Sixes, Oregon 97476 USA. This entry was posted in BOOK REVIEW and tagged Dog Business. Bookmark the permalink.